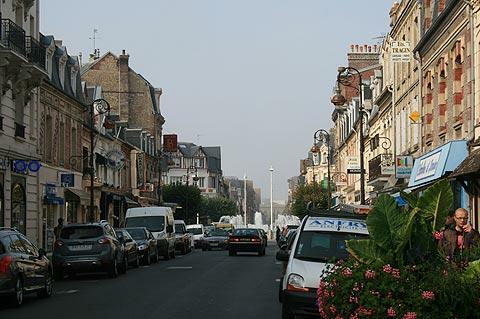 Deauville is found on the Normandy coast, adjacent to Trouville and south-west of Honfleur. 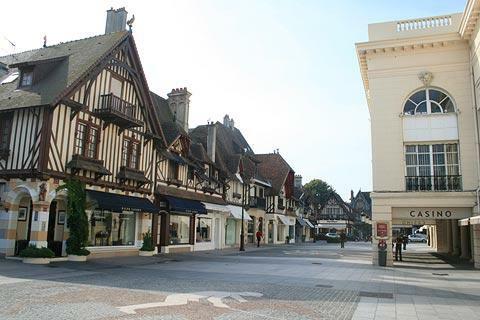 A part of the ‘Normandy Riviera’ Deauville is a lovely sea-side town with a great beach, great buildings, great shops and an annual film-festival not to mention a renowned race-track, golf and a casino. What more could you want? Deauville started life as the vision of the half-brother of Napoleon the Third. From the adjacent town of Trouville he looked across the marshes and dunes and decided to build a race-track. Elegant villas were built between the race-track and the sea and Deauville was born. When it was first created it was an up-market resort and has remained so ever since. Although initially founded and developed in the 19th century, it was in the early 20th century that the second wave of development took place in Deauville, including the renowned boardwalk along the coast, the sophisticated casino, and the grand hotels - the Hotel Normandy and the Royal Hotel, and the golf course. 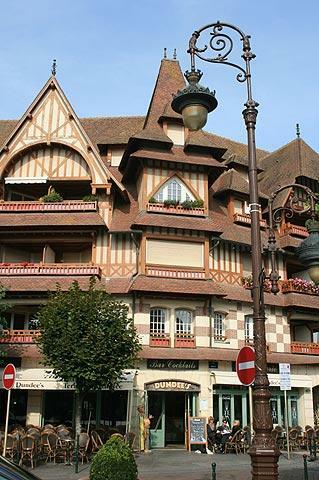 Lots of the buildings in Deauville are in the style of the lovely half-timber buildings typical of Normandy including the Hotel Normandy which is a large and beautiful building built in this style in the heart of the town. 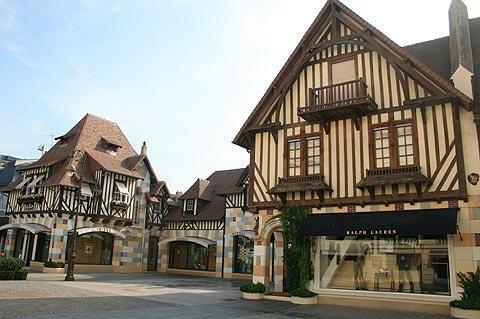 Near to the Hotel Normandy there is a cluster of very exclusive shops, every one of them a designer name boutique. 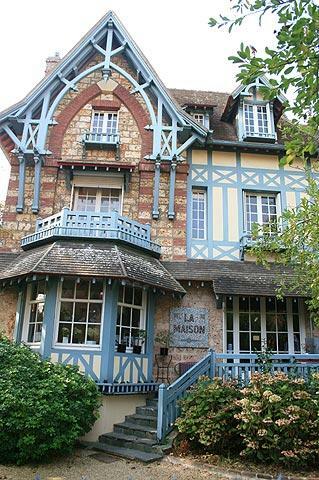 It is possible to take a guided walk of the magnificent villas of Deauville. More than 550 buildings have now been listed as historical monuments and you will discover Norman, Art Nouveau and Baroque buildings during this interesting promenade. 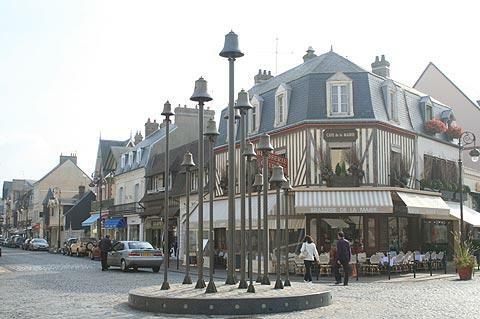 Also in the town look out for the Mairie and the unusual set of 12 bell chimes next to it. These ring throughout the day. Nearby, La Place Morny has been built as a copy of Paris’ Place de l’Etoile. Eight roads converge onto the central garden and fountains. 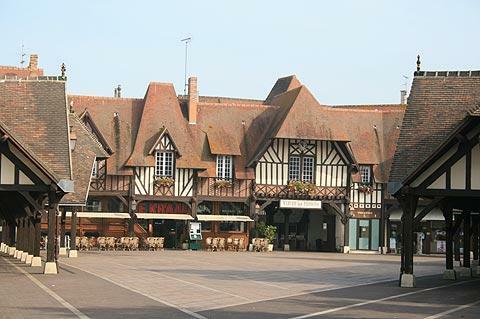 The Place du Marché, another square in Deauville has a market hall of built in the 1920s with a timber frame. Deauville has recently gained a reputation for its American film festivals that take place every year at the beginning of September. More recently an annual Asian film festival has begun. The town is also home to some major equestrian events: the race-track sits up above the town and has views down over the town - an excellent spot for a day at the races. Near the race-track up above the town you will notice the magnificent Villa Strassburger. 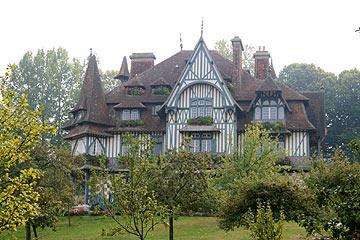 This was built at the beginning of the 20th century for the Baron Henri de Rothschild, it was then bought by the wealth American, Mr Strassburger whose son left the villa to the town of Deauville in 1980. 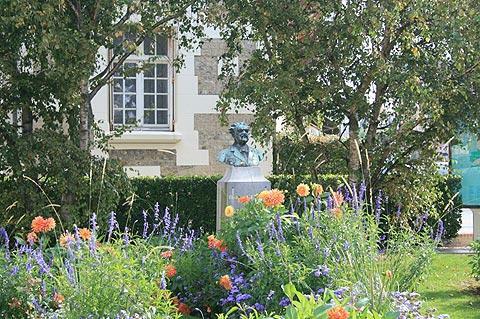 During the summer it is possible to visit the villa. Of course, despite all the impressive architecture, the major attraction at Deauville is the long beach of white sand. Even the beach manages to remain upmarket, with posh colourful umbrellas (something of a trademark for the town), and well maintained beach huts: unfortunately you will need to pay to use the parasols and beach huts! 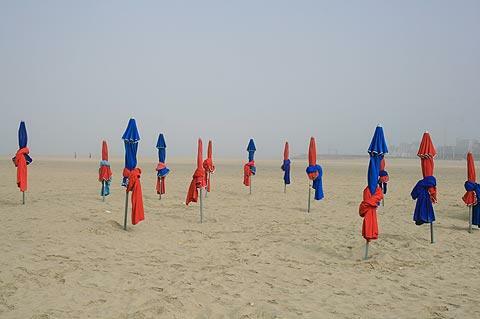 The beach huts are named after American stars who have come to Deauville for the film festival. The promenade along the 1.5 kilometre long boardwalk is a highlight of your visit, as is watching the racehorses training on the beach first thing in the morning (if you are up in time). There are lots of seafood restaurants along the waterfront where you can sit and watch the young and trendy passing by. The casino is also highly reputed and has a prime spot by the beach and the venue for the film festivals. 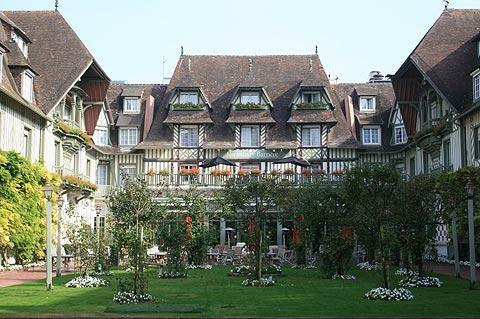 Dating from the founding of the resort the Hotel Normandy Barriere and Hotel Royal Barriere hotels are among the highlights of a visit and among the most impressive buildings in the town. 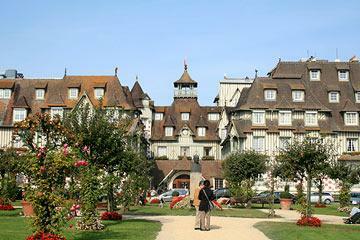 Both of these Deauville hotels rate very highly with visitors. 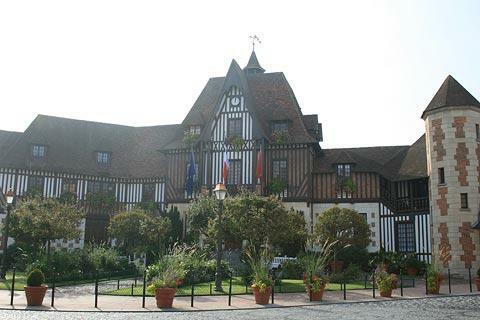 See Hotel Normandy Deauville and Royal Hotel Deauville for details, or to book somewhere very lovely to stay when you visit Deauville! 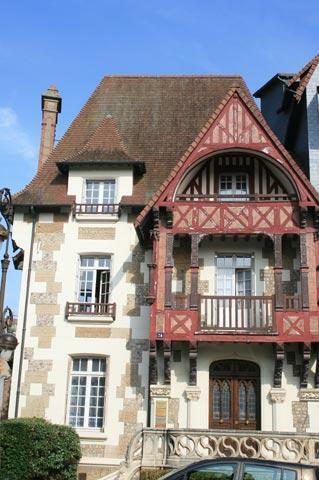 You will certainly want to travel along the Cote Fleurie looking at the scenery during yur stay here. 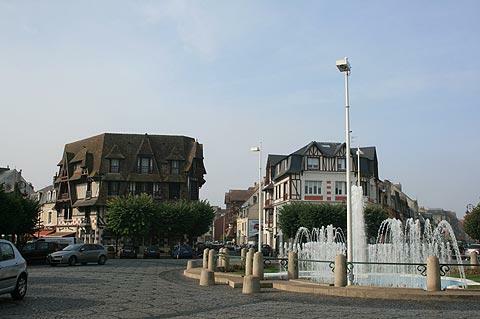 There are various other towns and resorts to explore along this popular section of Normandy coast, for example Trouville-sur-Mer is adjacent to Deauville to the north and Houlgate and Cabourg are a few kilometres to the south-west.